Google has made three new ads available online with just days if not hours left to go before it is expected to launch new Nexus devices. With a new Nexus 9 tablet and Nexus 6 smartphone peeping over the horizon, the three new ads have appeared just at the right time, with Google getting ready for another charm offensive while trying to peddle its new wares. The new ads also come just days before Apple is expected to announce two new iPads, and Google is clearly not ashamed of mixing it with the folks in Cupertino. The new ads aren’t the longest – two 15-second spots and a 30-second offering – but they do feature a new slogan for Android, with ‘Be together, not the same’ now rounding all three ads off. 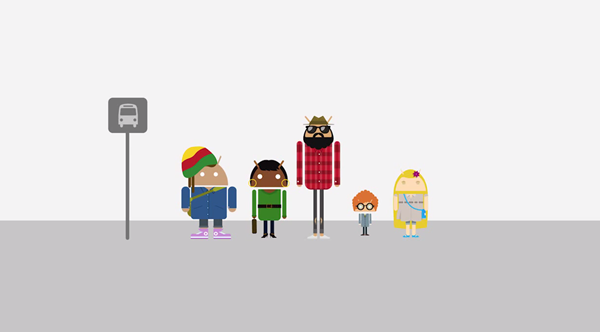 The gist of all three of Google’s new ads is that Android is for everyone while also giving enough options for users to not have to use the same hardware as everyone else. Call us cynical, but if that’s not a swipe at Apple then we’re not sure what is. Google’s reliance on third-party hardware makers can be a double-edged sword, but it does mean that potential customers are not short of options when they walk into a smartphone store. Google’s new spots will no doubt help propel the new Nexus tablet and smartphone devices into the public consciousness, something both the Android maker and its hardware partner HTC will be keen to do. With the media circus starting to turn away from the iPhone 6 and iPhone 6 Plus release, it’s time for attention to instead be focused on something new. Google will be hoping that’s something with an Android logo on. The Nexus 9 is believed to be on course for an announcement tomorrow, with the Nexus 6 penciled in for an appearance alongside it. The Nexus 6 is believed to be a derivative of the newly announced Moto X, except that it’s rumored to come with a large, 6-inch display. We’re not sure why Google is planning to go with such a monstrous screen size, but we’re certain that we’ll know when the announcements are made official by the Big G itself. We’ll keep an eye out for things so you don’t have to, so stay tuned. Tomorrow? There’s no official word on that, how are you so sure?